Northern Society of Chartered Accountants (NorSCA) and ICAEW are pleased to recognise the success of final year accountancy students who graduated from Northumbria University this summer. Sharon Logan received the Tyne & Wear Society of Chartered Accountants’ Prize for the Best Second Year Student in Financial Management (BA Honours, Accounting). Rebecca now plans to return to Northern Ireland and start training with Cavanagh Kelly in Dunagnnon; Jamie is hoping to work in Tax or Corporate Finance and Sharon is looking for a Financial Accountant role. 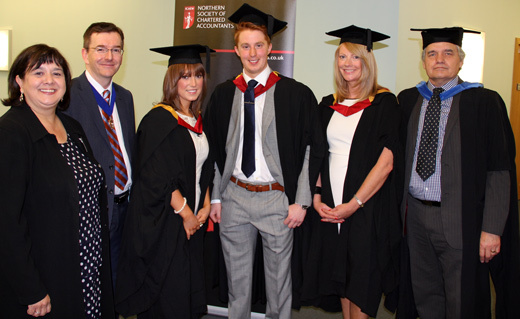 The official presentations were made at the graduation ceremony held at Northumbria University on Monday 14 July 2014, by Andrew Jackson FCA, President of Northern Society of Chartered Accountants. The BA (Honours) Accounting programme at Newcastle Business School is aimed at students with an interest in pursuing a career in accountancy or related areas. It is professionally accredited and graduates from the programme have taken up training contracts with professional accountancy firms and other leading international businesses such as PwC, KPMG, EY, Deloitte, Procter and Gamble. Other graduates are employed in industry and commerce, both in the UK and overseas. Northern Society of Chartered Accountants (NorSCA) represents 4,000 ICAEW members and ACA students working in business and the finance profession across the North East of England, Teesside, Northern Yorkshire and Cumbria. We have been assisting businesses in the north of England and producing chartered accountants for over 130 years. More information is available at norsca.co.uk.